My library system recently got funding to invest in a starter collection of Playaways. Trying to maximize the most of our funds, we opted for the Playaways rather than the Playaway views (which I have to admit are awesome- I’ve played with them at ALA Midwinter, so if you’re going to ALA Annual go check them out- they’re under Findaway World, booth 1657). At my location, I focused on youth and young adult titles, including those that I knew were ones that were going to be required summer reading, and they have circulated like CRAZY! My kids (I always call my youth patrons my kids) are familiar with how they work as the upper elementary and middle schools have them in their libraries, and they were so excited about “their” library having them. So today, in my kids words, I present to you why they think Playways are “super better” than audiobooks (with a translation in parenthesis). I don’t have to share with anyone (Playaways are self contained audiobooks that use headphones, so one person can listen at a time if you choose. If you want more than one, you can use an audio cord to plug it into a radio or your car, or a headphone splitter to use for multiple headphones). Do you have Playways in your library? What has been your experience? Share with us in the comments! 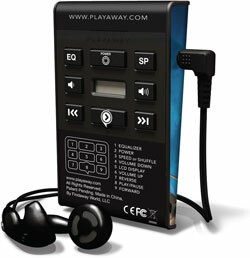 Karen’s Note: I checked out a Playaway from Christie’s library and I have this handy old iPod device that allowed me to listen to the Playaway on my car stereo. You simply plug the device into the earphone jack and put it on the correct radio station. Mine is seriously old, there are newer versions if you look around online. Also, I had Playaways at my old library system and they are popular because a lot of teens no longer have CD players for audio books because, you know, everything is on their phone. Actually, I don’t even own a CD player, though I do have one in my car which is where I listen to my audio books, which I now adore. For me the biggest issue for Playaways versus Books on CD is that I didn’t have to worry about the batteries running out and then I didn’t have to buy my own battery to replace in the unit (most libraries do not provide replacement batteries due to cost). June is Audio Book Month. Learn more and enter our Audio Book Giveaway.